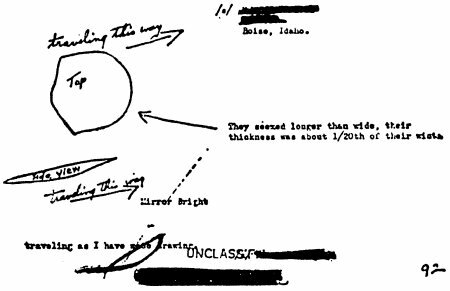 One problem that stands out in any attempt to make the Arnold case a True-UFO is the drawing in the Air Force files. The shape of the object in the top view is roughly similar to a shoe heel. Not only is it not round as all good flying saucers ought to be, it is for most practical purposes unique. Only one or two other cases even come close -- the 1947 Rhodes photo and perhaps the 1993 backdated recollections of Frank Kaufman concerning Roswell. The distinctiveness calls into question whether it should be considered part of the UFO phenomenon at all. J. Allen Hynek also offered an argument which should be addressed here since it is repeated by both critics and proponents of the case unaware it is partially erroneous. Hynek asserts that the eye cannot resolve objects that subtend an angle appreciably less than 3 minutes of arc. If we accept that Arnold was right in saying the objects were 25 miles away and that each object's length was 20 times its width, then a bit of trigonometry would put their size as 2000 feet in length. This being between a third and a half mile, it is simply too bloody huge to believe. Such a titan-size fleet would blot out the sun and a fair portion of sky to people beneath its flight path. How could only one person 25 miles away see this and everybody closer in miss it? This is the drawing of Arnold's objects from the original report in the Air Force files. Source: Brad Steiger, Project Blue Book, Ballantine, 1976. Hynek then takes a different tack. Accept the 25 miles for distance and accept Arnold's 45-50 estimate of length and the subtended angle is about 80 seconds (1 minute, 20 seconds) of arc and that is below the third minute resolution limit. Hynek understood that to be impossible.23 That judgment was too severe. Texts I have consulted generally put the limit of visual acuity at around 1 minute of arc. With increases of luminosity even that limit lowers.24 Since Arnold's sighting happened in full daylight and the objects were highly reflective by his own account, the conditions for resolution were optimal. It is perhaps worth adding that there are different types of visual acuity which can make it possible for the eye to detect wires as fine as 1/100 minute of arc. Deciding which form of acuity is applicable in this real-world situation isn't automatic. The detail of the report involving Arnold seeing the objects silhouetted against a snow suggests a practical analogy to the question of the limits of acuity in sunspot watching. In that situation, science shows the average person can detect sunspots as small as 27 seconds (roughly ½ minute), of arc. Hynek's calculation of 80 seconds thus would not be sufficient grounds for rejection of Arnold's report. It seems only fair to add that Arnold offered another measure of the objects, sizes worth pondering. He compared the angular size to the span between the engines of that passing DC-4 noted earlier which Arnold estimated as 15 miles distant. This gives a visual span of 2' 40", which is still better in terms of resolution plausibility while still being in the ballpark of being consistent with the other set of figures. They are still both tiny images, but not impossibly tiny. While this strengthens the credibility of Arnold as an observer and allows a more believable size to the objects to be assumed if the 25 miles distance is accepted, the paradox of the single observer status of the case stays relatively intact. We are still dealing with a five mile long chain of objects swooping past a national landmark in broad daylight at speeds in excess of 1,200 m.p.h. People closer in had to have taken notice of such a spectacle. If nothing else, the cascade of sonic booms generated by supersonic craft would be impossible to ignore even if everyone's attention was riveted elsewhere. Before we bestow the label of True-UFO to Arnold's objects, a serious search for an alternative must be done. The absence of a large population of corroborative witnesses near Mount Rainier seems sufficient grounds for wondering if the event was much more localized than Arnold surmised. A critical look at the distance estimate is both warranted and necessary. One must almost certainly accept the objects passed in front of Mount Rainier's snow field as Arnold claimed. The angular velocity of the objects indicated by Arnold's clocking of the objects between Mount Rainier and Mount Adams is .8 degrees per second. At that speed it would take nine seconds to cross the face of Mount Rainier at the 9,200 foot level indicated by Arnold's report. This is too long for a spurious observation related the fleetingness of the phenomenon. This would rule out explanations based on distant sky phenomena like a train of meteors, Campbellian mirages, or density-shifting space animals. What of distances closer than Mount Rainier's vicinity? It has been pointed out that Arnold spoke of the objects having "swerved in and out of the high mountain peaks." This would seem to put a lower limit to the distance if one could first determine which peaks they swung around and if they were broad enough to have a transit time to regard the observation as secure. Arnold was slightly more specific in later recountings of the event. In The Coming of the Saucers he said they momentarily disappeared "behind a jagged peak that juts out from Mount Rainier proper. "25 In his memoir for the First International UFO Congress he says, "When they turned length-wise or flat-wise to me they were very thin and they actually disappeared from sight behind a projection on Mount Rainier in the snowfield. "26 These are not exactly the same thing, but they give a fair indication of what to look for on the geological survey maps. Arnold estimated the crafts were at an altitude of 9,200 feet plus or minus 1,000. The task at hand is thus to locate some feature extending above the 8,200 foot level. This yields a neat little surprise. There are no such peaks between Mount Rainier and Mount Adams. The closest thing I could find was Pyramid Peak which stands only 6,937 feet tall in front of Mount Rainier's base. There is a sharp little projection called Little Tacoma which sticks out around the 10,000 foot level, but it is on the wrong side of the mountain to be seen from Arnold's flight path. It would be badly stretching things to suggest he got either his position or altitude that far wrong. Normally one prefers early accounts to later ones, but the Congress memoir may provide the clue to what happened here. When the object turned flatwise, the optical thickness likely dropped below the ½ minute resolution limit and briefly dropped from sight. The rough surface of the mountain provided opportunities for an illusory correlation of the disappearance to some feature of the mountain. The disappearance seemed to be caused by an intervening feature where none in fact existed. With no firm lower distance estimate, the way is opened for the objects being closer to Arnold than he had surmised. Return to Arnold's report: "They flew like many times I have observed geese to fly in a rather diagonal chain-like line as if they were linked together." That is what they certainly seem like. Geese do fly in chains. A number of nine makes sense. The arrangement of the leader being higher than the others, unlike military formations, is sensible for geese who take advantage of the downdraft turbulence of others in the formation for easier flying. Geese chains do undulate like kite tails. They do present a basically flat side profile when seen edge-on. From above they have a bilateral symmetry like the heel drawn by Arnold. In his Congress paper he however emphatically denies this idea," -- but they were not geese!" He does not explain the reasoning. If the 25 mile distance estimate is the root of it, we could simply shake it off. Other objections do suggest themselves however. 9,200 feet is a bit high for geese to be flying. As an experienced pilot, Arnold surely saw geese too often to be puzzled by their appearance. He speaks of the brilliant flashes of light reflected on the objects just before that quoted denial; maybe they were unusual in some way. The pulsation rate perhaps was subliminally felt to be wrong. Perhaps he felt he should have been able to see the necks and couldn't. They aren't on the drawing. Perhaps it was a different type of waterfowl. Swans would clear up most these objections. They normally migrate at night and birders complain "details of their flights are seldom observed. "27 When flying, it is known they travel exceptionally as high as 10,000 feet to take advantage of calmer air at that altitude and Arnold commented on the smoothness of the air he was travelling in at the time. Birds generally travel higher than their normal textbook rates in mountainous regions. The geometry of the encounter involves a shallow viewing angle and a flight path running parallel to the path of the objects -- he turned the plane to get a better look out the side window -- thus making identification optimally unlikely. An intersecting path or a higher viewing angle and the flapping wings would have cleared things up. Swans would be more reflective than geese. They "move deceptively fast. "28 The neck would be slenderer and harder to resolve than geese as the image approaches acuity limits. Will swans fit the established angular sizes and velocities? Arnold's clocking of the objects have them passing through an angle of roughly 80 degrees in 102 seconds. The plane was traveling at about 100 m.p.h., according to Arnolds Congress memoir. Swans travel roughly 50 m.p.h. Since they were traveling on parallel paths the relative velocity had to be 50 m.p.h. or 150 m.p.h. In the first situation, the angular velocity means the swans had to be close to a mile away. At that distance, the torso of swans (about 2-feet long) would subtend an angle of roughly 100 seconds (1 minute, 40 seconds) which fits in the ballpark of the observed figures calculated earlier. The situation of the 150 m.p.h. relative velocity would put the swans 3 times farther away and an angular image down around 30 seconds and thus doubtful. We can thus say a plausible case can be made for a fit in at least the first eventuality. Given the smaller size and velocity, the single witness status of the event falls into place. The DC-4 pilot wouldn't have a prayer of seeing a flock of swans 14 miles away. Ground observers would likely miss swans two miles up. The few that might notice them might never make the connection they had anything to do with Arnold's "saucers." If somebody did make the connection, would he overcome the reticence of saying the guy was that far wrong? That heel shape that Arnold drew could still be a source of sane objection. Even granting swans and heels are both bilaterally symmetrical, it is a stretch to call the match compelling. I suspect there is a different explanation for the heel shape. 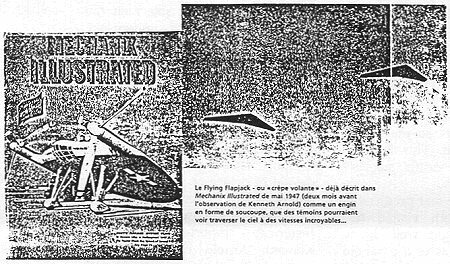 There was a plane of the era called a Flying Flapjack, which has a significant resemblance to Arnold's drawing. It was the fastest naval aircraft of its time. We can safely say Arnold was not looking at a Flying Flapjack in reality. There weren't nine of them around. They didn't fly quite so erratically. The relevant officials denied they were in the right place at the right time. But, they weren't secret. It might be pleaded that this second incident is less relevant than it strikes at first blush. It may less indicate a proneness to make a certain class of errors than the fact that Arnold could have been overwrought and desperate to find more proof of what happened to him in the midst of harsh media and public opinion. Such conditions did not exist during the first sighting. Yet, the fact remains we do have a troubling repetition under conditions where independent witnesses exist who put a rather mundane slant on stimuli Arnold hypes as extraordinary. One last issue begs to be brought up. Arnold was an experienced pilot and it could be pointed out that the average pilot would have ignored sufficiently geese-like phenomena once he was satisfied they did pose a collision threat. If they were the tiny image, so close to the limits of acuity, that calculations indicate they were, why did Arnold so over-react? One feature of the case invites notice as a possible psychogenic factor. Arnold wasn't in the vicinity of Mount Rainier by accident that day. He was searching the area to locate a large marine transport, a C-46, which had gone down and crashed a month and a half earlier. The families of the victims had put up a $5,000 cash reward for anyone who could locate the crash site so the bodies could be recovered. This involvement of a mass death suggests certain possibilities. One is that the feat predictably exists that if death visited this place once, it might well do so again. If Arnold was of a paranoid cast of mind to begin with, such a consideration could make him keyed up to over-react to the slightest stimulus -- a variant of a haunted house situation. A second possibility is that Arnold was jazzed up by the prospect of getting that money, but on another level of mind his superego was aware of the ghoulish nature of his search. His conscience might have induced twinges of self-loathing which manifested in fears of supernatural punishment -- the fear of collision initially, but also manifest in concern the objects were secret weapons. Still later, after the encounter and the publicity, he feared they could be used to carry atomic bombs and threaten life on earth.31 Here the psychology of paranoia colors the emotionality of the event and pushes what was fundamentally trivial into a higher level of significance. The undercurrent of Cold War tensions modeled on the surprise of the secret superweapon sprung on Hiroshima a couple years earlier would find in Arnold's paranoia a seed to grow a new fear for the culture to embrace. I am hopeful it is not personal conceit that lets me think prior skeptics were wrong in their solutions and that this is, finally, the correct one. It is simple logic that we can't all be right and that is assuredly disconcerting if one hopes that skepticism should lead to a conclusion that reasonable men can consider reliable and consensual. Some skeptics, I am tempted to warn, were governed by an idee fixe idiosyncratic to each which led them to apply solutions too repetitively in their work. So far as I can discern, I have no particular obsession with birds. I feel this solution is painfully banal and devoid of poetry or grandeur. It just seems to me it fits the most facts with the fewest loose ends. Only the historical importance of the Kenneth Arnold case makes the matter of its solution of any interest. Reject it and no larger consequences to our understanding of the flying saucer phenomenon seems to follow. Accept it and advocates will say, "So what? We didn't consider it a classic anyways." After 50 years though, aren't you glad we made the effort? Steiger, Brad, Project Blue Book, Ballantine, 1976, pp. 34-6. Geldard, Frank A., The Human Senses, John Wiley, 1966 pp. 83-7. Woodworth, Robert S. & Schlosberg, Harold, Experimental Psychology, Holt, Rinehart & Winston, 1965, pp. 382-6. Arnold, Kenneth, The Coming of the Saucers, Amherst, 1952. Arnold, Kenneth, "How It All Began" in Fuller, Curtis G., Proceedings of the First International UFO Congress, Warner, 1980, pp. 17-29. Aymar, Gordon C., Bird Flight, Dodd, Mead, 1936 p. 51. Heintzelman, Donald S., North American Ducks, Geese, & Swans, Winchester Press, 1978, p. 2. Kortright, Francis E., The Ducks, Geese and Swans of North America, Stackpole, 1967, p. 42. Project Blue Book microfilm roll #1, National Archives. Project Blue Book microfilm roll #1, ibid. Bruce Maccabee challenges the single witness character of the Kenneth Arnold classic in a paper titled True UFOs: Fantasy or Reality? He recounts a report by a prospector named Fred Johnson who saw several objects on the same day around the same time of the afternoon. Maccabee is impressed by the fact that Johnson was working on Mt. Adams, which is a reference point in Arnold's report and thus also puts him the same general locale. The objects were traveling on a southeasterly path which is in general agreement with Arnolds objects' trajectory. The prospector was working at about the 5,000 foot level and they flew over at an altitude not too far above him. This is vague, but consistent with Arnold's 9,200 ± 1,000 foot estimate. He also spoke of their speed as "greater than anything I ever saw." There are, however, differences. There seem to be only six or seven objects instead of nine. Arnold emphasizes he couldn't make out any tail on them in the original Air Force report and in his UFO Congress memoir he exclaimed, "I couldnt discern any tails on them, and I had never seen an aircraft without a tail!" He adds, I kept looking for their tails." Johnson apparently found them. He reported "an object in the tail end" that "looked like a big hand of a clock shifting from side to side." One could ascribe such differences to two or three objects breaking formation for unknown ends and Johnson possibly being closer to the objects than Arnold. The corroborative value is however reduced by such assumptions. Maccabee notes a further feature of Johnson's account that lends it a historical uniqueness -- a physical effect. While the objects were in view the needle of his compass waved from side to side. Menzel dismissed this effect as caused by a trembling of the hand engendered by the excitement of the sighting. Maccabee counters an experienced prospector would realize his compass would wobble if he didnt hold it steady. This sounds fair only out of the context of Menzel's discussion. He discounts this observation because faith in its validity would imply an immense magnetic field, which proponents of the ETH (Extraterrestrial Hypothesis) had argued was proof of a magnetic drive operated by extraterrestrials. Menzel believed such a notion was pseudoscientific mumbo-jumbo. Having encountered talk of magnetic drives in my reading of early ufology, I must agree. It is far easier to believe the prospector erred than that such a motive mechanism powers alien aeroforms sightseeing above the earths surface. An alternative psychological mechanism incidentally could be at work here. The hand might have been making small movements in synchrony with the swaying clock hand feature being observed by the witness. This happens below the level of awareness and has been known to some psychologists as the phenomenon of rhythmic entrainment. It underlies other phenomena like Ouija board pendulums and subtle body cuing experienced in social interactions. There is another candidate for corroborative witness in Loren Grosss, Charles Fort, The Fortean Society & Unidentified Flying Objects. Details are very scant. A member of the Washington State fire service was on lookout at Diamond Gap, just south of Mount Rainier. At 3 o'clock, the same time of Arnolds sighting, he observed "flashes in the distance quite high up in the east." Like Arnolds objects they "seemed to be going in a straight line and made a strange noise, higher pitched than most airplanes make." Whistling swans sing only in flight and the notes are loud, striking, and, though varied, can include a high flageolet note. This account is perilously lacking any information on which to evaluate any kind of interpretation of it. One warning must be posted to anyone hoping to argue this buttresses the position that Arnold's objects are True UFOs: why did this guy report hearing a high pitched noise and not a sonic boom?